Facts and history about the life and lifestyles of Native American Indians. The Dugout Canoe was the main type and mode of transportation used by the Native American tribes who inhabited the Northwest Pacific Coast, the Southeast and the Plateau region. The design and style of the dugout canoes were based on the natural resources that were available to the tribes, in this instance the people made use of the numerous large trees, especially cedar trees, found in their tribal homelands. The dugout canoe was made from the hollowed-out logs of large trees. 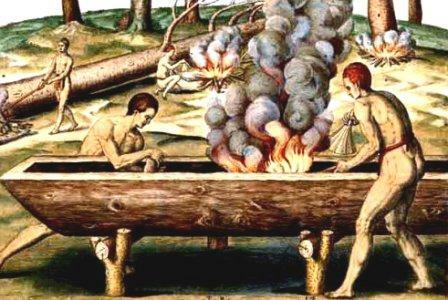 The tribes hollowed out logs using controlled fire or steaming to soften the timber so they could carve and shape their dugout canoe to have a flat bottom with straight sides. The Life and Lifestyle of Native American Indians is a varied and fascinating subject. The following fact sheet contains interesting facts and information on the Dugout Canoe. Native Indian Tribes across North America made different styles and designs of canoes. Dugout Canoe Fact 3: The Northwest Pacific Coast canoes were “dugouts” of single tree trunks. The logs were cut in summer time and fire was used to char the wood to be cut away. After it had been partly cut out inside it was stretched and shaped by steaming with water and hot stones. Dugout Canoe Fact 5: The Bella Coola and other Northwest Coast tribes used several different types of canoes, including long, narrow canoes of a single red cedar log for rivers and bigger types of seagoing canoes that were often decorated with crest designs or painted black. Dugout Canoe Fact 9: The names of Plateau tribes who built and travelled in dugout canoes included the Coeur d'Alene, Nez Perce, Cayuse, Modoc, Palouse, Spokane, Walla Walla and the Yakama. Dugout Canoe Fact 11: The Modoc constructed two types of dugout canoe. A large canoe, they called their large canoes "vunsh". These were suitable for open water navigation which was paddled and could hold four or five people. A smaller canoe, called a "vunshaga" held two people and was propelled by poling and primarily used to gather wocas seeds and duck eggs. Dugout Canoe Fact 15: The Southeastern Choctaw people established villages across the Deep South and used dugout canoes to travel and trade with many other tribes.